"Sampath Speaking" - the thoughts of an Insurer from Thiruvallikkeni: Venezuela selling Oil to Jamaica; Will Blake beat Bolt; Ashwin equals Prasanna !! Venezuela selling Oil to Jamaica; Will Blake beat Bolt; Ashwin equals Prasanna !! In Test no. 2211, Blackwood after making a 50 got out to Ravi Ashwin, caught Pujara – inside ede bat on to pad, for 63. In 2012 London Olympics, Yohan Blake ran so well – yet could not defeat his fellow mate – Usain Bolt in the 100 M finals. Blake and seven of the fastest men on the planet were on the track and Blake was the youngest. 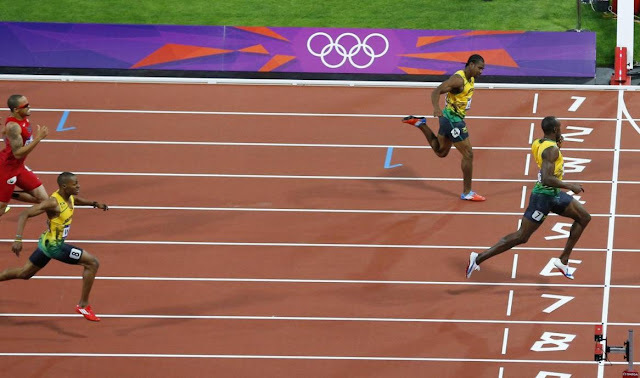 Less than two months earlier, he had beaten him in the Jamaican team trials in both the 100-meter and 200-meter sprints. Bolt, who had won gold at both distances at the Beijing Games in 2008, held the world 100-meter and 200-meter records. But in 2012, Blake had run faster than anyone in the world. .. will he do it this time ? is what their Nation wants to know !! There are many islands of the Caribbean and Jamaica is an island Nation of the Greater Antilles – 234 km in length. Kingston is the capital and largest city of Jamaica, located on the south-eastern coast of the island. For ages, the pitch was one amongst the hardest and fastest and one most dreaded by many batsmen. In 1976, India toured West Indies under Bishan Singh Bedi. WI won the first test at Bridgetown, by an innings and 97 runs. The second one at Port of Spain was drawn and the third one on Apr 1976 was historic. Indians chased 405 in the fourth innings and won by 6 wickets with Sunil Gavaskar and Vishwanath making centuries, ably supported by Mohinder Amarnath, Brijesh Patel and Madanlal. Test no. 776 in April 1976 was schemed to be different, bloody in fact. The score card would read India 306/6 decl !! ; WI 391 all out. India 97 all out and West Indies making the 13 runs required without losing a wicket. Statistics will never reveal the real story. WW Daniel made his debut in that bloody test, where Indians were intimidated with crowds calling for blood. No doubt the WI had class quickies but the strategy was questionable and many batsmen suffered nasty injuries trying to take evasive action. The short pitched bowling was overdone and Holding from round the wickets caused most damage to the bodies of Indians. The result could not have been dreamt of from the first day. From 178/1; Gavaskar bowled Holding for 66; Anshuman Gaekwad 58* and Mohinder 25* firm at the crease, it turned different. Gaekwad’s innings was one of raw courage taking several blows on the body and arms – the gears were not so protective those days. With the score at 237 Gaekwad was forced to retire bleeding in his ears. At 273 Brijesh Patel retired hit on the mouth. At 306 Venkatraghavan got out. Bedi wished to protect himself and Chandrasekhar from injuries and hence declared at 306/6. that was the test when one player after other had to be escorted to hospital with bleeding injuries. In the 2nd essay, only Gavaskar, Vengsarkar, Mohinder, Madanlal, Kirmani and Venkat padded up. Gaekwad was not in a position to play – so also were Gundappa Vishwanath and Brijesh Patel. Bedi & Chandra did not bat for the second time and with 5 batsmen absent hurt – it was recorded that Indians were all out for 97. It certainly is a different ball game these days ! On day 5 of the 2nd test at Sabina Park, Kingston, Jamaica – determined WI is battling to draw the test and perhaps could make that !! At lunch, they were 217/5, trailing by 89 runs with 5 wickets and around 60 overs remaining. With 113 and 7 for 83 against West Indies in Antigua last week, Ravichandran Ashwin became the first Indian - and only the third man from any country – to have a seven-for and a century in the same Test. Ian Botham actually did it twice. The other is Australian Jack Gregory, in 1920-21 at Melbourne. In our school days, just as we debated on MSV Vs Ilayaraja; Gavaskar Vs Vishwanath, Kamal Vs Rajini; Sridevi Vs Sripriya ….there was Srinivasa Venkatraghavan against Erapalli Ananda Sundara Prasanna. With that wicket of Blackwood, Ashwin equalled the tally of EAS Prasanna – 189 in 34 matches / 63 innings; Pras did it in 49 tests /86 innings. Harbhajan Singh has 417, the only offie ahead. Venkat took 156 in 57 Tests while Shivlal Yadav another successful offie took 102 in 35 tests. Anil Kumble, Bishan Bedi, Chandrasekhar, Vinoo Mankad, Ravi Shasri, Subash Gupte, Dilip Doshi and Pragyan Ojha are the other spinners in the 100+ test wickets club. There was this talent from Tamil Nadu, who could easily have reached higher, but faded too fast. Before 19, he won a Test for India with 12 wicket haul and followed it with another 7 in the next [19 from 4 innings !] but went on to take only 26 wickets ending up with 9 test appearances. It was Laxman Sivaramakrishnan who debuted in Antigua in Test no. 956 in 1983. The island Nation Jamaica announced last week that it would provide up to $4 million in the form of goods and services to Venezuela. Venezuela is selling oil to Jamaica in exchange for food, medicine, farming materials and building supplies. This form of payment is part of a trade pact between the two nations. Venezuela is desperately short on food and medicine. People wait hours outside supermarkets to buy basic goods like milk, eggs and flour, often only to find empty shelves. Others are dying in ill-equipped hospitals. Despite the chronic shortages, the Venezuelan government has refused the help of international humanitarian groups like United Nations and Amnesty International. To tackle food shortages, Venezuela recently issued a decree that would force citizens to work on farms for 60-day periods and perhaps longer "if circumstances merit," the decree said. Amnesty International said the decree "amounts to forced labour." 3rd Aug 2016 @ 22:30 hrs.